The three-alarm blaze that broke out at an under-construction apartment complex in downtown Concord last month has been determined to be arson, the Bureau of Alcohol, Tobacco, Firearms and Explosives announced Wednesday. 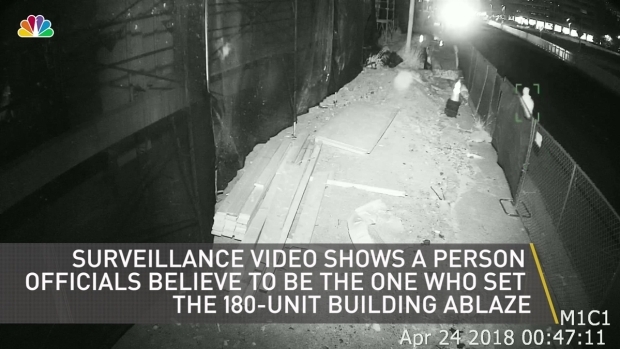 Investigators released a surveillance video that showed a suspect entering the construction site with a bag, then later running out without the bag and with the building appearing to aglow behind. 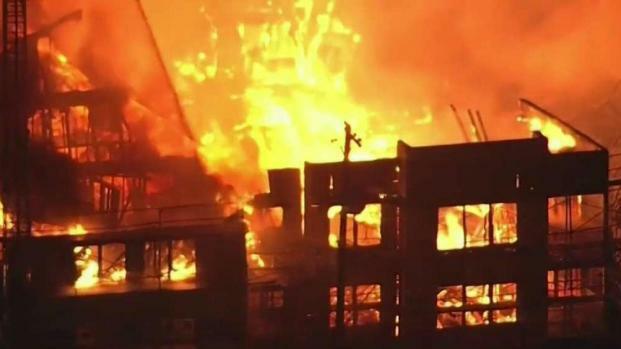 Towering flames soaring into the air on the morning of April 24 torched the five-story, 180-unit apartment building located at 1905 Concord Boulevard, resulting in roughly $55 million in damages, according to fire officials. Ernst Freitag, the owner of Alpine Pastry & Cakes bakery next to the arson site, said he lost about $40,000 in goods, and he had to close his store for 11 days. Freitag said he already suspected arson, and after seeing the surveillance video, he said it's "unnerving" said that "It's a miracle we're up and standing." The fire left burned debris structurally unstable, forcing 250 residents at a neighboring apartment building to evacuate and stay away from their residences for multiple days. "It was hell on earth, really. I just looked up in the air, and there was literally flying fire just coming down," one of the neighboring resident who had to evacuate, Tim Nicholas, told NBC Bay Area. "You could have killed someone. 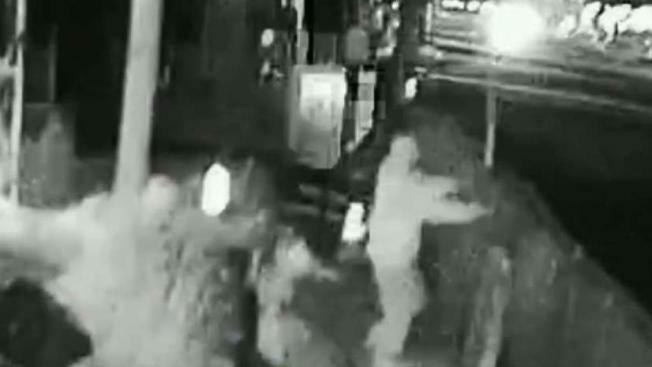 You could have killed an innocent person that night," Nicholas said as he saw the surveillance video of the suspect. An investigation into the fire is still ongoing. The ATF is offering up to $25,000 for any information leading to the arrest and conviction of the person or persons determined to be responsible for the blaze. The three-alarm blaze that broke out at an under-construction apartment complex in Concord last month has been determined to be arson, the Bureau of Alcohol, Tobacco, Firearms and Explosives announced Wednesday.